Hey out there to all of you gals who sew! Last week I found a modern playsuit pattern by Simplicity! Summer is just around the corner in the U.S. so I plan on making a bunch of these for myself. 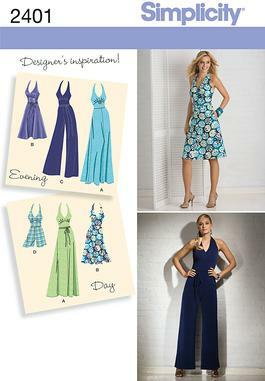 This pattern is Simplicity 2401, with view D as the halter playsuit/romper. Bonus for us voluptuous vixens, it goes all the way up to size 22! I think I'll whip up a matching circle skirt to wear over the playsuit. 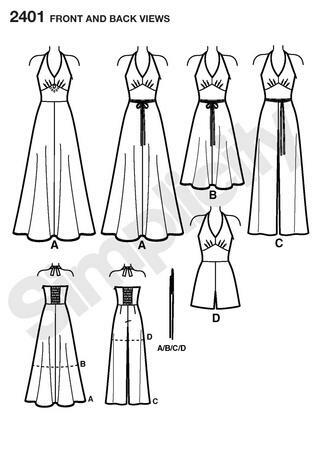 You could easily jazz up this pattern by changing the colors of the bodice, middle section and shorts or adding some decorative buttons down the tummy section. I think my first one will be a sailor playsuit! *cute*!! Check your local fabric stores for pattern sales before you buy! Often you can find them for 99 cents at Joannes and Hancock Fabrics! I'll post pics when I get around to finishing one! What's that, you don't sew? That's okay, check out some of these lovely options that you can buy! I so want a playsuit! Lovely options for those of us who cannot sew. I totally live in rompers during the summer and these are so DARLING. I can't sew but I have a mother who does and LOTS OF GRANDCHILDREN to bribe her with!!! Simplicity patterns are almost $20 here >n< I love that one though, hopefully I can find someplace that sells it online for a decent price. Thanks for the heads up - is it a current pattern? I wish I owned a sewing machine - these are so cute! Hi sweet dear, thank you so very much for stopping by Chronically Vintage for a visit, it's an absolute delight to meet you! This post is so much fun! Over the last year I've started crushing on play suits (especially those with a wrap/detachable skirt over top of a pair of shorts of a bathing suit, and love that you shared a modern pattern with us that looks so delightfully old school. Wishing you a gorgeous Friday & weekend ahead! Oooo I can't wait to see the ones you make!! extra cute. What a sweet blog. I think I may hang around a bit. I love the fact that you post curvy gal friendly vintage wear. NOT ENOUGH of it out there. Wonderful sailor style suit. Wonderful! I had't seen this even though I flip through the pattern books like they're juicy novels. Thank you for mentioning it. I love the stretchy back. Some playsuits have zips that make entry and exit less practical. OMG awesome! My friend Erin and I were just saying how we can't figure out how you get all this done with two kids and blog too. I just started a blog a couple months ago and I have a ten month old. I'm also trying to sew, sew, sew for myself and so I can start a business. It can be very discouraging sometimes and you feel like you aren't getting anywhere. If you tell me that it took you a while to get here it might make me feel better ;) tee hee.